I now have a silent partner who asked me for a book trailer. I never got into those, but NOW I HAVE. All I can say is, Thank God for iMovie. And the Freak Fandango Orchestra. Any thumbs up appreciated. Denise Nielsen said their music warmed her up on this cold January day. They’re a Barcelona-based group that tours the world. I’m also hard at work on Stockholm Syndrome, the fourth Hope Sze novel, where Hope gets taken hostage on the obstetric ward. Dr. Severine Laplante gave me a tour of St. Mary’s Hospital, updated my obstetric knowledge, and introduced me to a new Russian restaurant, La Caverne. We started off with a light carrot salad, then borscht served in wooden bowls with wooden spoons, and finished off with Pelmenis (pierogi things). Yum! Also, my lovelies, I’m finally raising my cheap e-book prices shortly, so consider yourselves forewarned. Come say hi at the University of Ottawa Healthcare Symposium (UOHS) on January 24th and the Canadian Federation of University Women on the 27th. I don’t bite. Much. Why should I go to a mystery convention? To prostitute myself, of course. Bloody Words, Part I.
I was very worried about losing money at Bloody Words 2014. Kris Rusch and Dean Wesley Smith had beaten into me that the surest path to success in writing is simply production. Sit in your garret and write, day and night, month after month, year after year. Your craft will improve, and once you have hundreds or thousands of items for sale, someone will take notice. You don’t need to go to cons and promote if you don’t want to. Melissa, I decided to come to Bloody Words this year. Here are seven (or so) reasons why you should come: (1) To push Terminally Ill, (2) to join me, Howard Shrier, and Ken Wishnia in a Yiddish cussing contest, (3) celebrate the publication of your short story in Ellery Queen (whenever it comes out), (4) administer first aid when I fall off the dais, (5) sign my copy of Terminally Ill, (6) buy a drink for the reviewer who plugged your book in Ellery Queen, and (7) be the final name on the attendees roster (beating out S.G. Wong). How could I say no? I plunked down $190 for the conference fee. I’d already booked that weekend off for Yocomo, the Montreal yoga conference. But I’d go to Bloody Words instead. Maybe I’d sell a few copies of my book. Then it started to haunt me. What if nobody bought my book? What if I spent $199 per night at the Hyatt Regency and just went into debt? I started calling my friends to angst about it. My friends Bob Jeschonek and Richard Quarry told me not to think about it like a return on investment, just go and network. This is me. On Pixabay. Obviously. I drove myself to downtown Toronto and hurried to Scene of the Crime Books, the book dealer who would sell my books during the con. Right afterward, I realized that I had lost my phone. With cash in the case. Aaaaagh! After worrying about losing money, I’d just lost an smart phone plus cold, hard cash. I’ll save you the suspense. Someone had already turned it in. THANK YOU. Fortunately, I already had plans. I headed out to dinner at Aroma Fine Indian with my Medical Post editor, Carol Hilton. I tried the fiery Goan prawns, in honour of my most recently completed book, The Goa Yoga School of Slayers, sequel to The Italian School for Assassins. 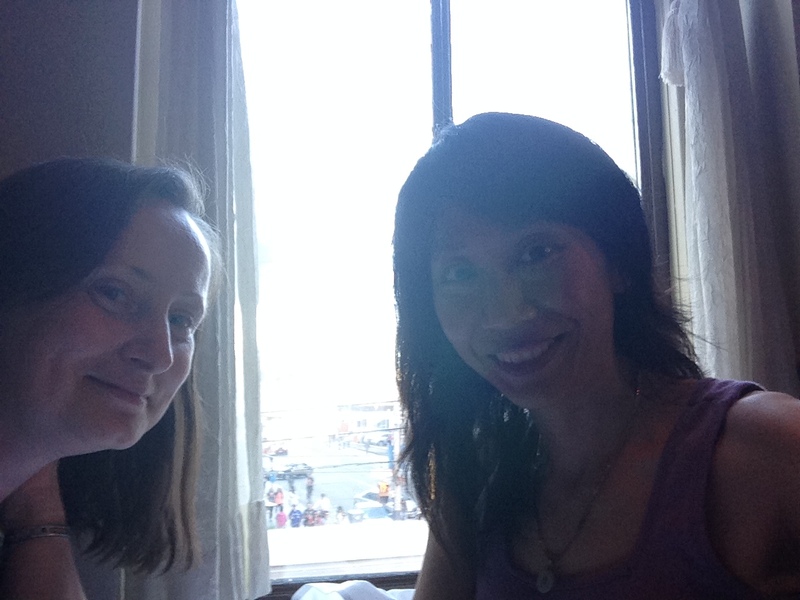 We talked about everything from medical politics to technology to travel. Kind of like the Medical Post, actually. Thanks, Carol! Did you know that Carol (on the left) has a degree in marine biology? Pretty nifty, eh? And did you know that it’s hard to take a selfie in front of a window? 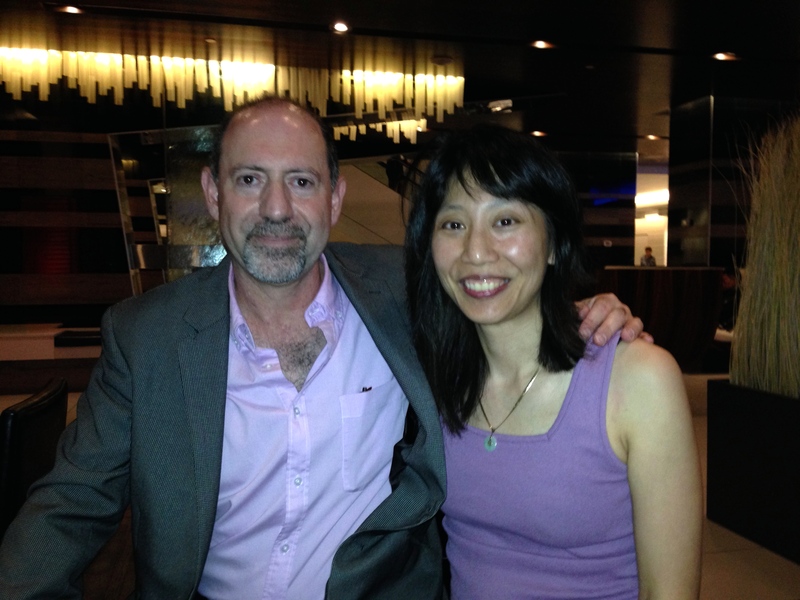 Steve Steinbock & me, Melissa Yi. The bag is medical swag because his wife is a radiation oncologist. Another fun fact: Steve interviewed Stephen King for Ellery Queen. I move among royalty now, people. Kings and Queens. We ended up having dinner and drinks with Tanis Mallow, a Noir writer, co-host of Noir @ the Bar in Toronto, and a warm and funny person; John McFetridge and his wife Laurie, who would whip out appropriate props like his latest book, Black Rock, and the newest issue of Quill & Quire with John on the cover. (Wow!) I’d already Tweeted Rob Brunet, because he’s a fellow Canadian who had a story accepted to Ellery Queen, as well as many other markets—he tries to have a new story published every month, and his novel, Stinking Rich, will debut in September. Ken Wishnia did show up to offer some Yiddish swear words, but it turned out that his writing has also been nominated for the Edgar, the Anthony, and the Macavity Awards. Uh huh. Steve said these mystery conferences are like Brigadoon, a town springing out of nowhere. 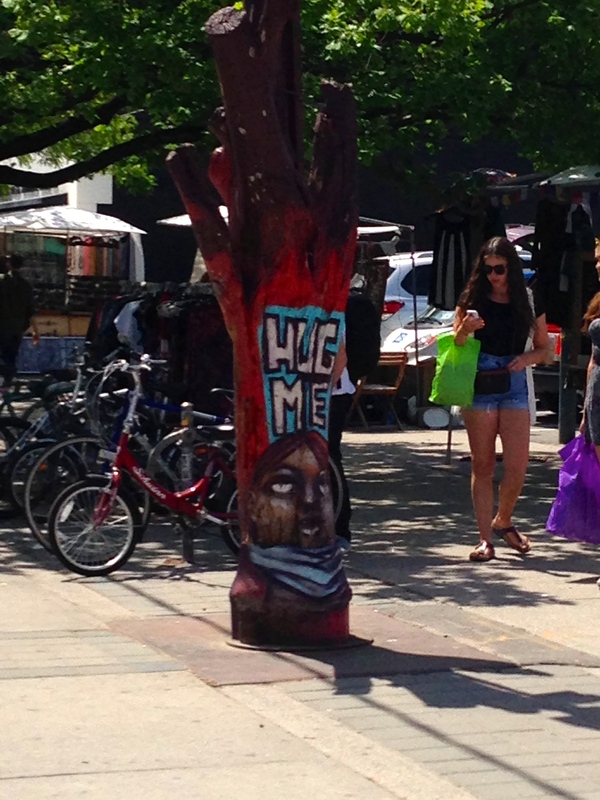 What I saw was a tribe of intelligent, crime-loving writers and super readers who enjoyed meeting like-minded people. One thing I find really sad about general North American society is that intelligence is undervalued. “You’re smart, aren’t you” isn’t always a compliment. Neither are the terms “intellectual” or “perpetual student.” Asian and Jewish cultures value scholars, but outside of universities, you’re a bit isolated. But here, you’ve got a bunch of people who like the same things you do! What a miracle! Steve signed this and wrote, “Thanks for sending me Hope!” Words cannot express the goodness of this man. 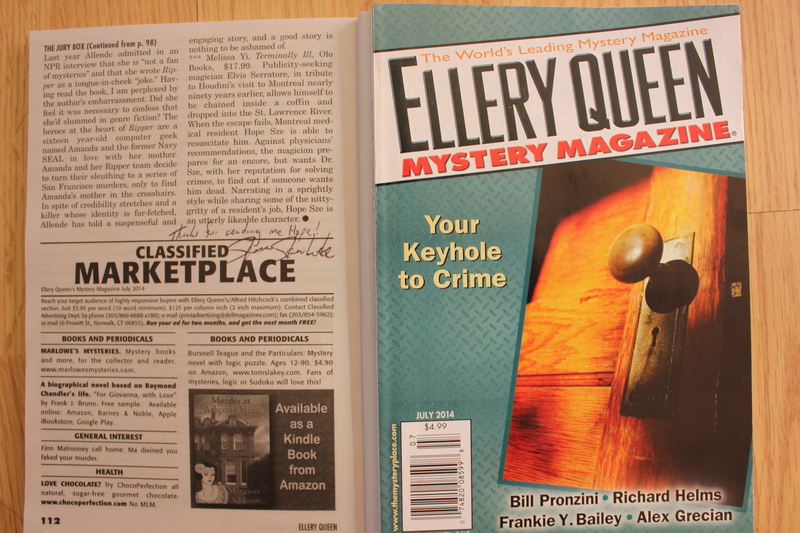 By a stroke of luck, all Bloody Words participants received the July 2014 copy of Ellery Queen’s Mystery Magazine. The one where Steve pronounces Hope Sze an “utterly likeable character.” I’ll just keep repeating that. When I’m on my deathbed, I’ll be like, “utterly likeable character,” and my great-grandkids will be like, Wot? Steve is a walking encyclopedia, certainly of the mystery genre, but of Jewish mysticism and, I’m sure, other topics. He was embarrassed that I called him a scholar, but it’s rare enough to meet people who genuinely love learning. Not for a degree, not because of publications or prestige or money, but just to discover. Perhaps more importantly, he’s kind and caring. Rob Brunet said that Steve had taken him under his wing a few years ago, and Steve’s obviously doing the same for me. Most people have their group of friends and figure they’re busy enough, but Steve will recruit newbies and make sure they’re not just standing in the corner, looking agonized. I did buy Steve a drink (he said I didn’t have to, but I spoke to the waiter), and ended up paying for his salad too, which embarrassed him again, and Steve and Tanis and Rob walked me back to my apartment, since I stayed at a lovely airbnb instead of the Hyatt. I have two things two say about this. Nowadays, most people lead lives of unseen desperation. They’re not necessarily quiet. They may be loud. Buy my book! I have a new car! Check out my abs! I am so smart! My cat is cute! The problem is, it seems like no one else cares. For example, you may write a book, but no one reads it. Or they read it and tell you it’s terrible. You can tell that, between medicine and writing, I’m always waiting for the left hook. I respect Steve even more because, I, personally, would find it hard to listen to desperate writers blather on and on about their work. It would be easier to turn away and say, “Don’t worry. Have a drink.” And I’ve heard that many critics grow bitter, forced to read and review books they don’t like. So imagine Steve going to a con on his free time and surrounding himself with writers instead! 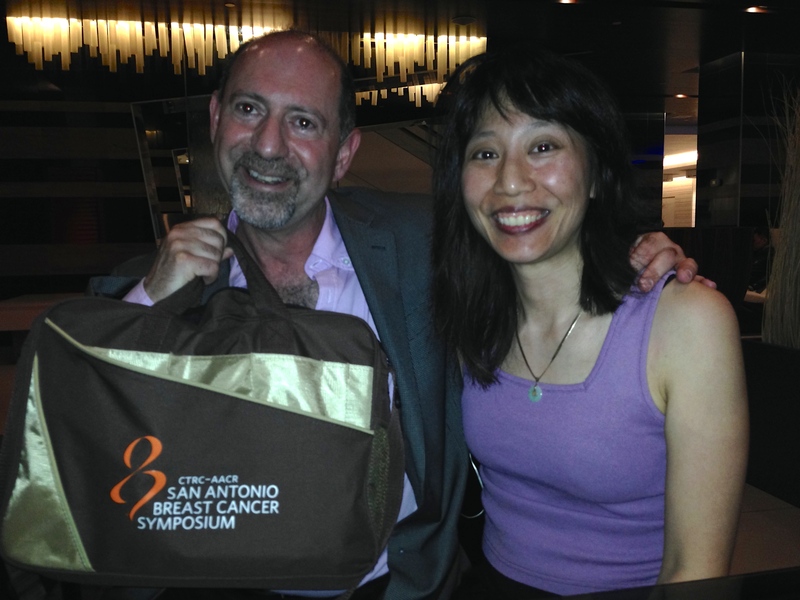 Steve Steinbock surrounded by writer Melissa Yi, without the medical swag. Why am I repeating our names? I heard it’s good for SEO optimization. I know it’s annoying. Sorry. To get back to the Thoreau quote, I’m generally cheery. My friend Yasmin once told me I was one of the happiest person she knows. But between medicine, writing, and life in general, I have tasted despair. With Steve and the rest of my new friends, though, happiness wins. And I loved how the people at Bloody Words were singing their song, loudly and clearly. The rest of the world may not understand or appreciate their writing or their weirdness, but they kept on singing. I finally realized that Bloody Words was not about making or losing money. It was about friendship. Also creativity and craziness. Like this. Oy oy oy oy oy. Oy. Why am I wearing a sign with my book cover? What am I doing to Ken Wishnia? Did I sell any books? How can a con inspire creativity? Tune in to my next blog post, Bloody Words Part II, for the answers. Ellery Queen, I love you. 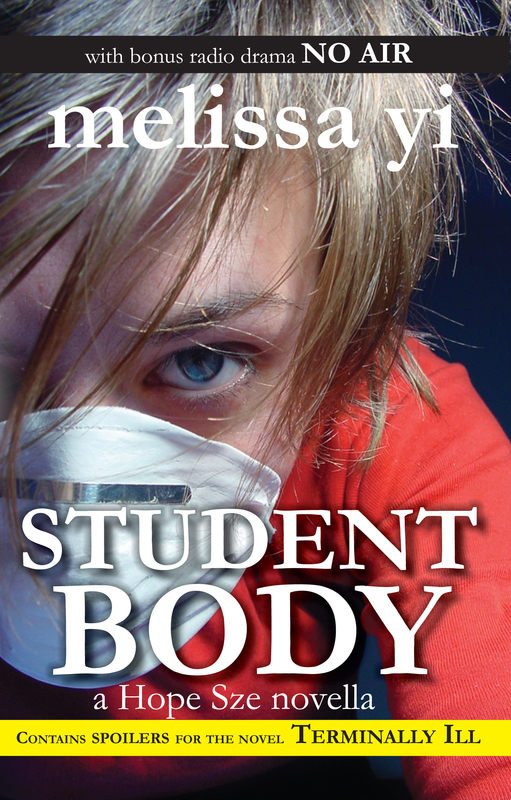 Thanks for reviewing TERMINALLY ILL. Plus, the new Hope Sze novella! Ellery Queen’s Mystery Magazine reviewed Terminally Ill in its July issue. Kris said it was too long to type in, but had a good pull quote. I liked the sound of too long. Better than a one-liner. I downloaded the July version, stat. 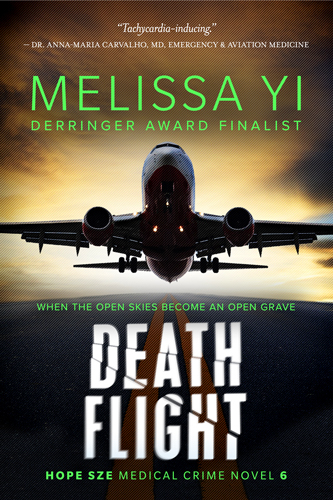 Melissa Yi, Terminally Ill, Olo Books, $17.99. Publicity-seeking magician Elvis Serratore, in tribute to Houdini’s visit to Montreal nearly ninety years earlier, allows himself to be chained inside a coffin and dropped into the St. Lawrence River. When the escape fails, Montreal medical resident Hope Sze is able to resuscitate him. Against physicians’ recommendations, the magician prepares for an encore, but wants Dr. Sze, with her reputation for solving crimes, to find out if someone wants him dead. Narrating in a sprightly style while sharing some of the nitty-gritty of a resident’s job, Hope Sze is an utterly likeable character. I found the pull quote and highlighted it for you! You’re welcome. Click to buy. You know you want to. And if you already bought, mwah! Hmm. Wonder if I can use that, too. The other authors he reviewed include Isabel Allende. Um, hi, Isabel. Excuse me while I faint. I know the haters out there are like, Big whoop, so I’m just going to explain why I’m tooting my own horn. Again. And I still have some toots left over, so bear with me. 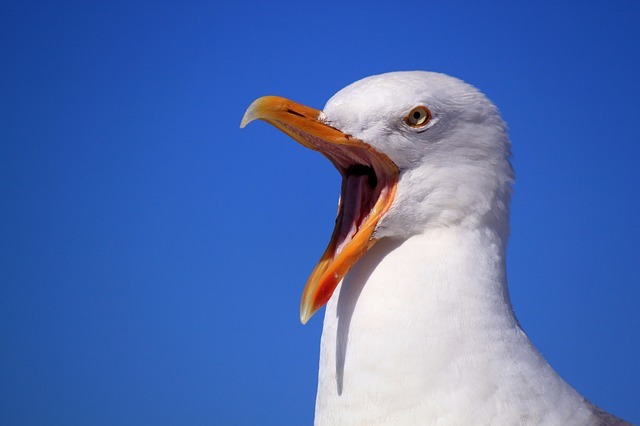 Haters, why don’t you resent this seagull instead? It’s much braggier than me. Photo by Pixabay. EQMM is the longest-running mystery magazine in the world, founded in 1941. Stephen King declared Ellery Queen’s Mystery Magazine “the best mystery magazine in the world, bar none.” Dorothy Parker was a fan, okay? From a business point of view, gaebler.com estimates EQMM’s circulation as 180,000. According to its own reader survey, more than 70% of EQMM readers buy books by the authors they first read in this magazine’s pages. Half of their readers devour more than 15 mystery novels every year. Plus, now I have a pull quote that spans the series, since it praises the character instead of one book. However, I’m still pushing Publishers Weekly’s “entertaining and insightful” as hard as I can. Which isn’t very hard. 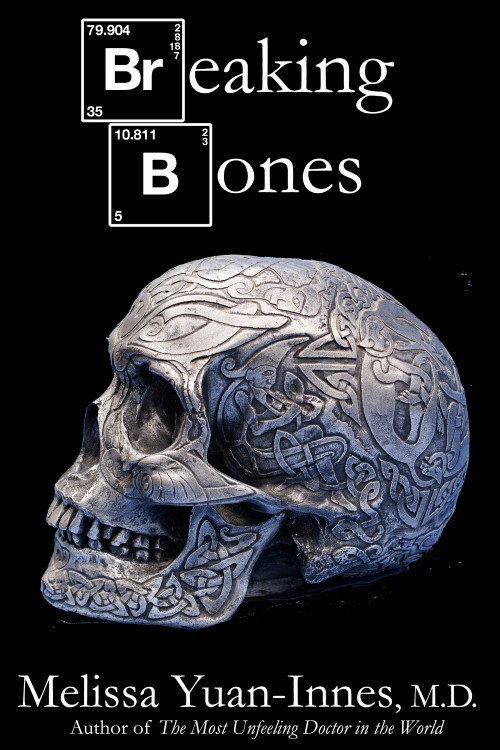 It’s on the book cover and the online blurbs. Best of all, Ellery Queen bought one of my short stories, “Om.” So even if readers skip past both reviews, at some point, their eyes might land on my yoga murder story, and I hope to sell EQMM many more. Short stories can be gold like that, as Mark Leslie Lefebvre and I talked about in our Kobo podcast here. 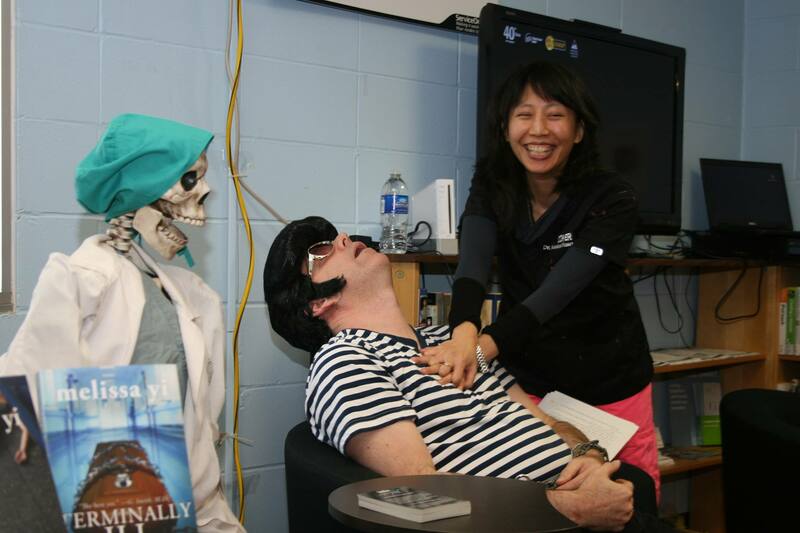 Mark Leslie Lefebvre, unable to conduct a podcast interview because he’s too busy being resuscitated as Elvis Serratore, the escape artist from Terminally Ill. Photo by Margaret Caldbick of the Glengarry News. Anyway, I just revived myself with smelling salts. Excuse me while I plotz. That’s Yiddish. I gotta practice because I’m heading to Bloody Words 2014 June 6-8th, and Steve Steinbock (yes, the very same Steve Steinbock. I’m swimming with the big leagues now) has challenged me to a Yiddish cursing contest. Wait a minute. 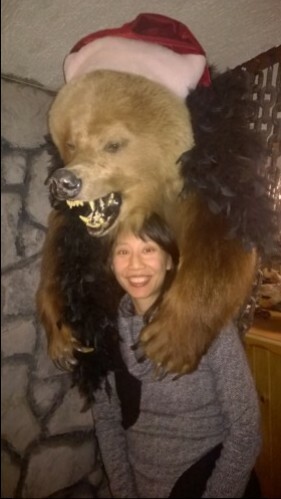 I might help out an Edgar Award nominee? The world is a crazy place. But I just love it sometimes. P.S. 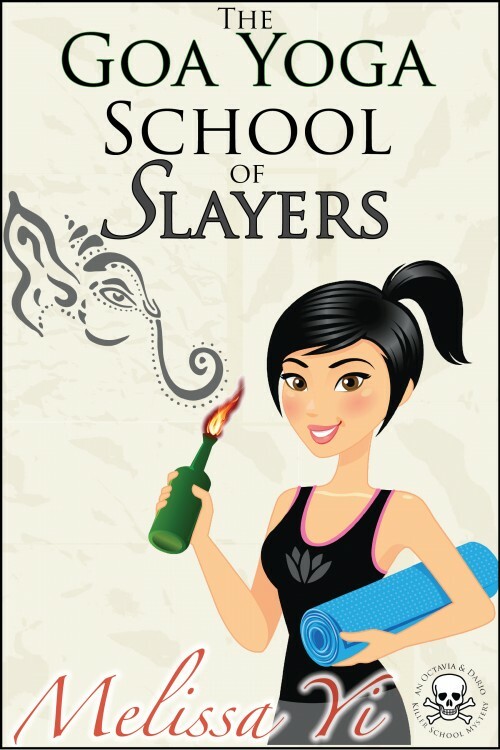 To my two Melissa Yin fans: I just finished the second draft of The Goa Yoga School of Slayers, the sequel to The Italian School for Assassins (with thanks to Italian writer Barbara G. Tarn for editing my dreadful Google translate Italian), so stay tuned for another silly, lighthearted mystery cozy!